This is a recipe for the beginning of spring, when the first fresh asparagus arrives in the markets. 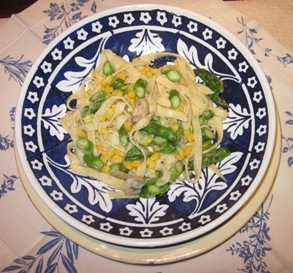 Even better late in the spring when both asparagus and corn are fresh. This is adapted from a recipe by noted chef Scott Conant, that appeared in a "Best Chefs" section of Food and Wine. The recipe adds a spicy flavor which really makes it work. Plus it is simple and easy to prepare. Once again we suggest your own home-made fettuccine (see www.classicpasta.com for instructions) but fine store-bought fresh egg pasta also works. Note: Scott uses one jalapeno pepper, seeded and thinly sliced, rather than the red pepper flakes. Your choice! Prepare the asparagus: break off the tough bottoms by holding a stalk at both ends and breaking it. Cut the usable stems on a diagonal about one-half inch in length, but leave the tips whole. De-stem the mushrooms and thinly slice. If using frozen corn, defrost it. -- tender but still al dente -- about two to three minutes. Add a few twists of the pepper mill, and stir. Get five quarts of water up to a raging boil. Add two tablespoons of salt. Add the pasta. Cook until al dente. Reserve a cup of the pasta liquid and then drain well. Add the pasta to the heated sauce. Add the water from the reserved liquid to keep the sauce moist. Cover and turn up the heat and cook for one minute, until the pasta is steaming hot. Uncover, add the Parmesan and stir. Taste for salt, and serve on warmed plates, with some Parmesan on the side.